Tupolev Tu-154B-1 EK-85166 (c/n 166) parked on the ramp at Amsterdam Int'l Airport sometime in 1996. Armenia Air Lines was formed from Aeroflot's Armenia directorate. Armenian Airlines had used Tupolev airplanes. But following tightening of environmental regulations, the Tupolevs were banned from landing in European airports because they did not meet emissions and noise standards. For this, Armenian Airlines began leasing in 1998, with an option to buy, the Airbus A310. The contract stirred controversy among those who questioned why the Government airline was, for the first time, using a non-Russian-made aircraft. But some foreign agencies doing business in Armenia said they could not get life insurance for employees who flew on Tupolevs, due to the aircrafts' history of problems. 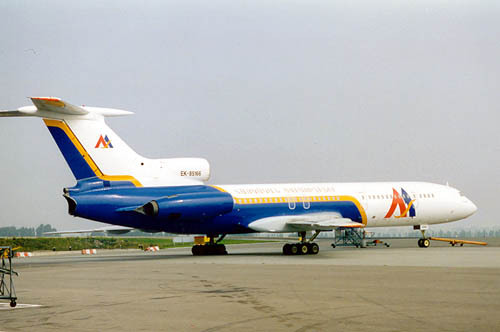 The Airbus, then, became the European link for the "official airline of Armenia". Armenian Airlines faced disruption of its European operations following engine failure on January 21st 2002 which caused a Yerevan-to-Paris flight to turn around mid-air and return to Zvartnots International Airport where the crippled Airbus landed safely. On January 28th, representatives of Armenian Airlines visited London to discuss means for getting the Airbus repaired. According to directors of the company, the repair bill could go as high as $2 million, the quickest solution being to replace the damaged engine. Otherwise, the engine would have to be sent either to Brussels, Belgium or Toulouse, France for repairs but that could take months. The A310 was the only aircraft in the Armenian Airlines fleet that met European aviation regulations. It flew every day on routes to Paris, Amsterdam or Frankfurt. The technical problems remained with its Airbus A310 and the company ran in financial problems. Cooperation was started with the new Belgian operator VG Airlines (later renamed Delsey Airlines); but the Belgian operator had to file for bankruptcy on November 05th, 2002. Armenian Airlines was reported to be looking for cooperation with Armenian International Airways to continue or restart its flights into Europe. 1 October 2002 Source: ArmenianDaily: "The newly appointed head of Armenian Airlines, Arsen Avetisian, said the Yerevan Zvartnots airport will soon have a runway, the only one in the CIS that will allow landings and take offs in any weather conditions. He dismissed allegations that the Armenian Airlines was recognized as bankrupt. "It will remain and will develop through seeking cooperation with other companies" he said, adding that the company still owns several Soviet-made planes which are capable of operating flights". The company is said to be holding negotiations with a Russian company to get a $10 million loan. Armenian Airlines current debt is $19 million. Armenian Airlines was officially declared bankrupt on 15Apr03 and its rights were sold to ArmAvia (a 70% subsidiary of Sibir Airlines).